Very private, beautifully remodeled, fully furnished single family home in quiet Los Altos neighborhood. Available mid-June to mid-August – ideal for a relocating or visiting executive and family. 3 bedrooms, includes large upstairs, private loft bedroom, master suite+ additional ground floor bedroom. 2 full baths, open family room/kitchen – adjacent separate office, separate dining room, formal living room, separate media room with surround sound. Kitchen is fully equipped with high end appliances, 6 burner Viking range, SubZero fridge, Bosch dishwasher, convection oven and built-in microwave. Approx. 2500 sq. ft. on a 16000 sq. ft. lot with pool, nice patios, fruit trees and barbecue. Off street driveway parking. No smoking. 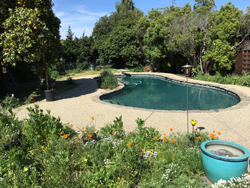 Centrally located in a safe, quiet neighborhood of Silicon Valley with close proximity to the beautiful trails and farm at Rancho San Antonio Park. Grocery stores nearby include Trader Joe’s, Lucky, Safeway, Ranch 99, and Nijiya Market. YMCA and Cuesta park facilities approx. 1 mile away, large park with play structure and tennis courts around the corner. Dozens of restaurants within 2 miles; downtown MV and Los Altos less than 3 miles away. Easy access to highways 85, 101, 280 and 237 and most top Silicon Valley employers. Convenient to both San Francisco and San Jose airports, approx. 35 and 20 minutes away. Utilities: (PG&E, water & garbage) included with a $350 per month cap, overage will be deducted from deposit.